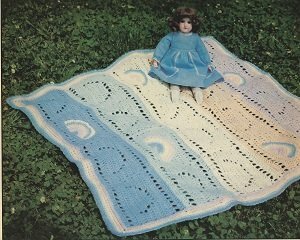 This crochet baby blanket is a perfect gift idea, for either a boy or a girl. So it can be made up ahead of time and save that last minute rush. This free pattern is fairly easy when you follow it step by step or should I say row by row. Baby will love the feel of this colorful, cuddly afghan. Made of squares sewn together to form strips, this crochet baby afghan is a good project to carry along. Each square can be made in less than an hour. Five rain-bows, made separately, are appliqued, one on each strip. This would also be a great pattern to use if you crochet for charity. So if you are looking for new baby blanket donations to make, this would be perfect project. Lion Brand Debyshire yarn, a 3 ply sport yarn available in 2 ounce skeins, was used for the model, Debyshire is a Wintuk yarn of Dupont orlon Acrylic, machine wash-able and dryable. Wintuk is a certification mark for yarns meeting DuPont's fiber content specifications. 1 tapestry needle to sew squares and strips together. Gauge: Each square is approximately 7 x 7 inches. Finished afghan is approximately 30 1/2 x 37 1/2 inches. Note: Ch 3 on turn always counts as first dc of next row. Square: Make 4 squares in each of the colors: A, B, C, D, E. Ch 27. Row 1: Dc in 4th ch from hook, dc in each ch — 25 dc counting turning ch. Ch 3, turn. Row 2: Ch 3 counted as first st, *sk next dc, dc in next dc, ch 2, repeat from *, end with de in last dc, ch 3, turn – 12 ch 2 spaces. Row 3: *Dc in ch 2 sp, dc in dc, repeat from * across – 25 dc. Ch 3, turn. Row 4: Dc in each dc, ch 3, turn. Row 5: Ch 3 is first dc, dc in each of next 4 dc, ch 2, sk 1 dc, dc in each of next 13 dc, ch 2, sk 1 dc, dc in each of next 5 dc, ch 3, turn. Row 6: Ch 3 is first dc, dc in each of next 4 dc, ch 2, sk ch 2 sp, dc in each of next 13 dc, ch 2, sk ch 2 sp, dc in each of next 5 dc, ch 3, turn. Row 7: Ch 3 is first dc, dc in each of next 4 dc, dc in ch 2 sp, ch 2, sk 1 dc, dc in each of next 11 dc, ch 2, sk 1 dc, dc in ch 2 sp, dc in each of next 5 dc, ch 3, turn. Row 8: Ch 3 is first dc, dc in each of next 5 dc, dc in ch 2 sp, ch 2, sk 1 dc, dc in each of next 9 dc, ch 2, sk 1 dc, dc in ch 2 sp, dc in each of next 6 sts, ch 3, turn. Row 9: Ch 3 is first dc, dc in each of next 6 sts, dc in ch 2 sp, dc in next dc, (ch 2, sk 1 dc, dc in next dc) 4 times, dc in ch 2 sp, dc. in each of next 7 dc, ch 3, turn. Row 10: Dc in each dc and ch 2 sp, ch 3, turn. Row 13: Repeat Row 3, fasten off. Make 5. Make 2 in the following color sequence: A, B, C, D, E; make one: B, A, C, D, E; make one: E, D, C, B, A; make one: A, B, D, E, C. With first color, ch 10. At the end of all following rows, fasten off color. Do not turn. Next row begins at beginning of previous row. Row 1: Sc in 2nd ch from hook, sc in each ch 9 sc. Row 2: Join first color to beginning of Row 1. Sc in each of 4 sc, 2 sc in next sc, sc in each of 4 sc -10 sc. Row 3: Join 2nd color to beginning of Row 2. Sc in each of 2 sc, *2 sc in next sc, sc in next sc, 2 sc in next sc, repeat from * once more, end sc in each of 2 sc -14 sc. Row 4: Join 3rd color to beginning of last row. *Sc in each of 2 sc, 2 sc in next sc, repeat from * 3 times more, end sc in each of 2 sc -18 sc. Row 5: Join 4th color to beginning of last row. *Sc in each of 2 sc, 2 sc in next sc, sc in each of 4 sc, 2 sc in next sc, repeat from *, end sc in each of 2 sc ---22 sc. Row 6: Join last color to beginning of last row. *Sc in each of 2 sc, 2 sc in next sc, sc in each of 3 sc, 2 sc in next sc, sc in each of 2 sc, repeat from * once, end 2 sc in next sc, sc in each of 2 sc, 2 sc in last sc. Row 7: Join last color to beginning of last row. Sc in each sc. Fasten off. Finishing: Weave 4 squares of each color tog to form strips. Weave the 5 strips tog in the following color sequence: A, B, C, D, E, picking up back 1p of st only. Steam seams lightly on wrong side, making sure piece is flat. Border: Border is worked in A, B, C, D, E color sequence. Row 1: Join A at upper right corner. With right side facing, sc in each dc across top, 3 sc in corner, work 2 sc in each dc down side of blanket, 3 sc in corner, sc across lower edge, 3 sc in corner, 2 sc in each dc along side edge (make sure corresponding sides have same number of sts and piece is flat), ending 2 sc in starting corner. Join with sl st. Fasten off A, join B. Row 2: With B, sc in each sc, 3 sc in each corner, picking up back lp of st only, end 2 sc in starting corner, join with sl st. Fasten off B, join C. Repeat Row 2, completing color sequence. Do not fasten off E at end of last row. Trim: With right side facing, working backwards from left to right, ch 1, sc in first sc (go through both parts of st), *sk 1, sc in next sc, going through both parts of st and making sure sc is worked loose enough so work doesn't draw in. Repeat from * around. Join with sl st. Fasten off. Steam border lightly. Sew rainbow appliques to blanket as desired or as follows: On 3rd A square from right; on first B square from right; on 4th C square from right; on 2nd D square from right: on 3rd E square from right. Steam blanket lightly to measurements.